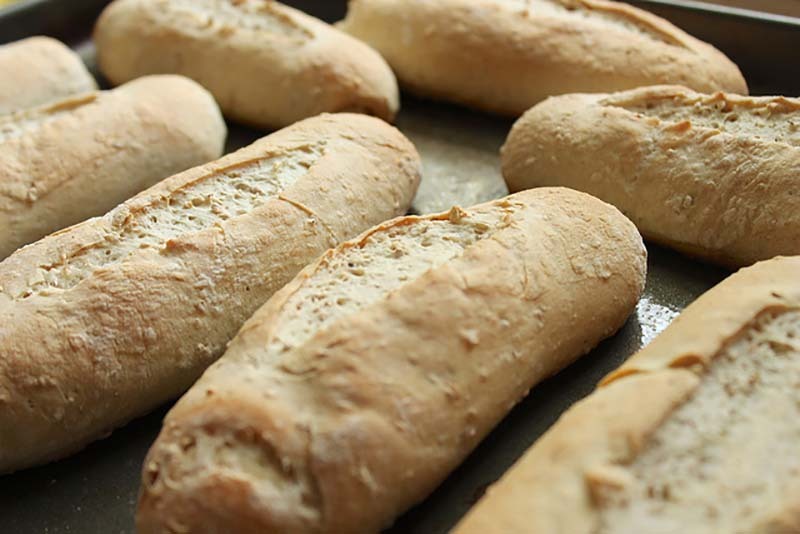 Simple to make, these sourdough rolls have the added flavor and texture of cracked wheat. Have water and oil at 80º F and all other ingredients at room temperature.Place ingredients in pan in the order listed. Select dough/manual cycle. Do not use the delay. Check dough consistency after 5 minutes of kneading. The dough should be in a soft, tacky ball. If it is dry and stiff, add water, ½ to 1 TBSP at a time. If it is too wet and sticky, add 1 TBSP of flour at a time. When cycle is complete, remove dough and follow directions under the Shaping, Rising and Baking section. See our Bread Machine section for more helpful tips and information. Dry mixture: Combine yeast, 1 cup flour, and other dry ingredients; set aside. Combine water and oil; heat to 120º to 130º F.
Hand-Held Mixer Method: Combine sourdough starter, dry mixture, and warm liquid ingredients in mixing bowl on low speed. Beat 2 to 3 minutes on medium speed. By hand, stir in enough remaining flour to make a firm dough. Knead on floured surface 5 to 7 minutes or until smooth and elastic. Use additional flour if necessary. Place dough in lightly oiled bowl and turn to grease top. Cover; let rise until dough tests ripe. Stand Mixer Method: Combine sourdough starter, dry mixture, and liquid ingredients in mixing bowl with paddle or beaters for 4 minutes on medium speed. Gradually add flour and knead with dough hook(s) 5 to 7 minutes until smooth and elastic. Place dough in lightly oiled bowl and turn to grease top. Cover; let rise until dough tests ripe. Food Processor Method: Put sourdough starter and dry mixture in processing bowl with steel blade. While motor is running, add liquid ingredients. Process until mixed. Continue processing, adding remaining flour until dough forms a ball. Place dough in lightly oiled bowl and turn to grease top. Cover; let rise until dough tests ripe. Turn dough onto lightly floured surface; punch down to remove air bubbles. Divide dough into 8 pieces. On lightly floured surface, roll each piece to a 6 x 4-inch rectangle. Starting with the longer side, roll up tightly, pressing dough into roll with each turn. Pinch edges and ends to seal. Place on greased cookie sheet. Cover; let rise until doubled. With sharp knife, make a lengthwise slash down the center of each roll. Brush with cold water. Bake in preheated 400º F oven 20 to 25 minutes or until brown. Remove from cookie sheet; cool. Delicious! I did change the flour measurements to 1 cup whole wheat and 2 cups bread flour; and, since I used whole wheat flour, I also added 2 tsp. vital wheat gluten! I also did not have cracked wheat, so I used 3 T. wheat germ for texture and flavor. Between these 2 changes, my dough needed an extra 2 T. water. Made the dough in my bread machine-easy! Will be making this again tomorrow to keep a batch or 2 handy in our deep freezer! I saw this recipe on Eat Your Heart Out, and knew that these had to be on the list to make! I made them this afternoon and used the Platinum yeast (first time using the Platinum) and they came out great! I quickly put some of them in the freezer, since there are just two of us at home anymore because I knew if I didn’t, we wouldn’t be able to stop eating them. I love the nutty wheat texture and taste that the cracked wheat gives them. Definitely will make them again!